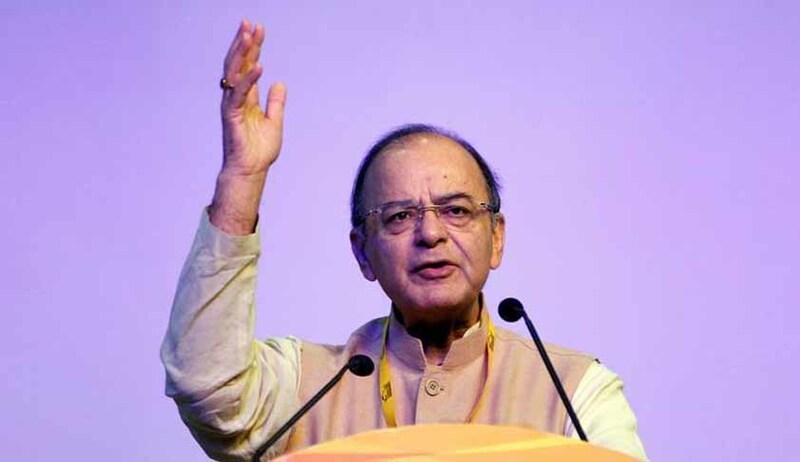 Union Minister Arun Jaitley, on Sunday, advised the Congress to "look at the mirror" before creating a fuss about the non-elevation of Chief Justice of Uttarakhand High Court, Justice K.M. Joseph to the Supreme Court. "The executive can give inputs, it can even refer a recommendation back with relevant inputs for reconsideration but is eventually bound by the recommendations. This is contrary to the text of the Constitution. The hue and cry made by my friends in the Congress Party recently when the Government referred a case back for reconsideration, fades into the oblivion. It is part of the much diluted role of an elected Government that relevant inputs be brought to the notice of the collegium. This is consonance with democratic accountability. All must know this important chapter of history. I have written this blog so that my friends in the Congress party get an opportunity to look at the mirror." His note begins with elaborating on such instances in the Nehruvian era. He wrote that when the first Chief Justice of the Federal Court, Justice H.J. Kania started recommending names for appointment to the High Courts, "it caused a significant flutter". While Pt. Nehru "questioned his suitability to be the first Chief Justice of India", it was Home Minister Sardar Patel’s pragmatism that enabled him to "manage" Justice Kania, he added. He further wrote that Justice Bachu Jagannadha Das made it to the Supreme Court "because of his strong Congress party connections" as his name was "strongly recommended" by Rajendra Prasad, V.V. Giri and then Orissa Chief Minister H.K. Mahtab. "Such political recommendations are today unthinkable," he asserted. With regard to the Indira Gandhi era, he elaborated on the Government's attempts at appointing such Judges to the Supreme Court who may successfully help the State in reversing the decision in the case of Golakhnath v. State of Punjab, wherein it was held that Fundamental Rights cannot be abridged or taken away by the amending procedure in Article 368 of the Constitution of India. In order to overturn this case in the then pending case of Kesavananda Bharati & Ors. v. State of Kerala, a machinery was set in motion with Law Minister H.R. Gokhale and Steel and Mines Minister, Mohan Kumaramangalam, taking charge for appointing Judges who followed the "social and political philosophy of the Government". This was because the senior judges of the Supreme Court included a Judge who was a part of the majority opinion in the Golaknath case and some others who had expressed their opinions against the Government. He quoted an excerpt from a publication to elaborate on this point: "Never before could any of the Judges who were to be seen to have a primary political sponsor, it had to be accepted that the appointments were initiated by the Chief Justice to the Law Minister. Law Minister H.R. Gokhale initiated the appointment of his Bombay High Court colleagues D.G. Palekar, Y.V. Chandrachud, Sidhartha Shankar Ray recommended Subimal Chandra Ray and A.K. Mukherjee; Mohan Kumaramangalam recommended K.K. Mathew, C Subramaniam recommended his classmate Alagiriswamy and Indira Gandhi herself recommended Mirza Hameedullah Beg and Surendra Narayan Dwivedifrom family’s home town, Allahabad." He then wrote, "This was a pre-preparation for changing the numbers equation in the Kesavanand Bharati case which had to sit in review of the Golaknath case. Needless to say that many of the above who were on the bench were part of the pro-Government minority opinion in the Kesavananda Bharati case." He asserted that after the hearing of the case began, the Government vehemently tried to influence the judgment in its favor. He wrote about the Government's attempts at delaying the case until Justice Sikri's retirement, so that Justice Shelat, Justice Grover and Justice Hegde could be superseded to change the arithmetic of the bench. Finally, out of the thirteen Judges, six held that fundamental rights were unamendable, and the other six held that Parliament had the power to amend every Article of the Constitution. The thirteenth judge, H.R. Khanna held that the implied limitation on the power to amend was in relation to the basic structure of the Constitution of India. Justice Khanna's opinion finally became the law. However, what came after this judgment was the Government's wrath in the form of supersession of Judges who ruled against it. He wrote, "After the judgement had been read and the Chief Justice read out the final order with regard to the law declared by the Supreme Court and then signed the same, he circulated it to the bench for signatures. Four of the dissenting judges – Ray, Beg, Mathew and Dwivedi refused to sign the order. The Kesavananda Bharati’s final order is signed by only nine of the thirteen judges. That very day Shelat, Grover and Hegde were superseded and A.N. Ray become the new Chief Justice. Upon Ray’s retirement, Khanna was superseded and Beg became the Chief Justice."